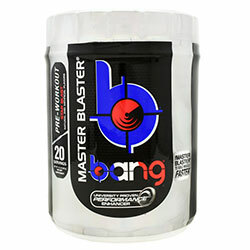 Product Details: Bang Pre-Workout Master Blaster. Potent Brain And Body Fuel. Make No Mistake --New Bang Master Blaster Is Not Your Stereotypical Life-Sucking / Muscle Destroying Pre-Workout "Concentrate". The Very Definition of Bang Screams Scientific BREAKTHROUGH! Infused With Patented Water-Stable SUPER CREATINE—BANG Triggered A Major PARADIGM SHIFT Among The Performance And Bodybuilding Authorities And Has Now Become The Most Disruptive Scientific Innovation In The 30-Year History Of Sports Nutrition! 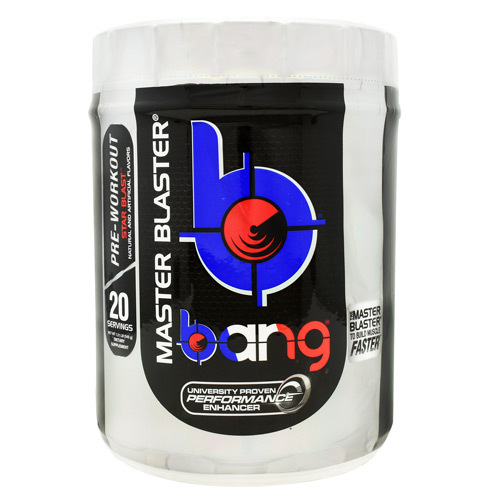 In A Very Short Period, BANG Beverage Has Risen To The Top; Consequently, Generating Unrelenting Consumer Demand For The BANG MASTER BLASTER Pre-Workout. BANG MASTER BLASTER Is Designed Around The Patented Super Creatine-Amino Acid Di-Peptide That Is Far More Soluble Than Regular Creatine And L-Leucine. Furthermore, The NEW BANG MASTER BLASTER Pre-Workout Contains Massive Doses Of Clean Performance- Enhancing And Bodybuilding Ingredients Designed To Work In Concert With SUPER CREATINE. All Ingredients Are Fully Disclosed On This Label Because We Are Proud That BANG MASTER BLASTER Is The Most Potent, Best Tasting Pre-Workout Supplement In History! Other Ingredients: Natural and Artificial Flavors, Sucralose, and Lecithin.